1 strawberry flavored Special K bar with a big gulp of water. 1:20PM Highlights Salon on Newbury St. Appointment to get my hair done in an updo with my friend Karen. The stylists were really nice, and even brought me a cup of tea with honey while I was in the middle of getting my hair done. I brought in pictures of the hairstyles that I was interested in, but the stylist kind of went off and started doing her own thing. Oh well haha. 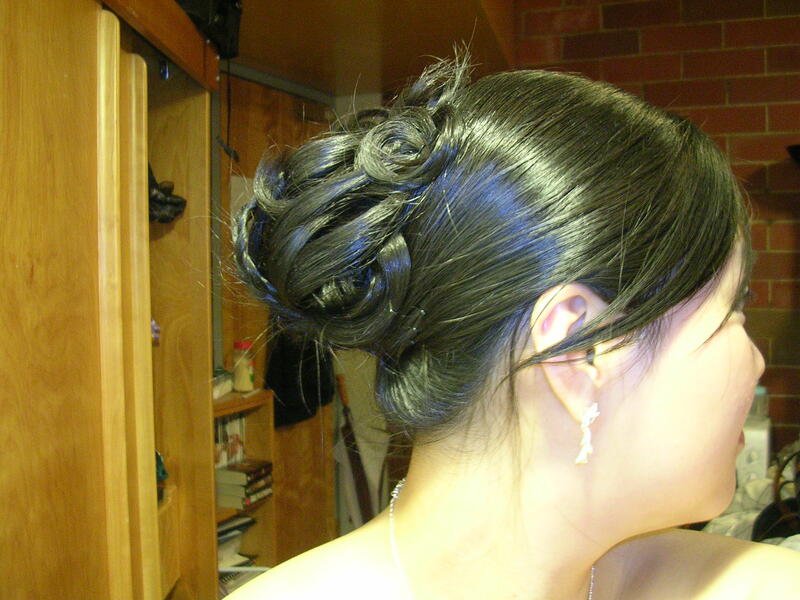 It took an hour and a half to do the whole updo, but I liked how it turned out. 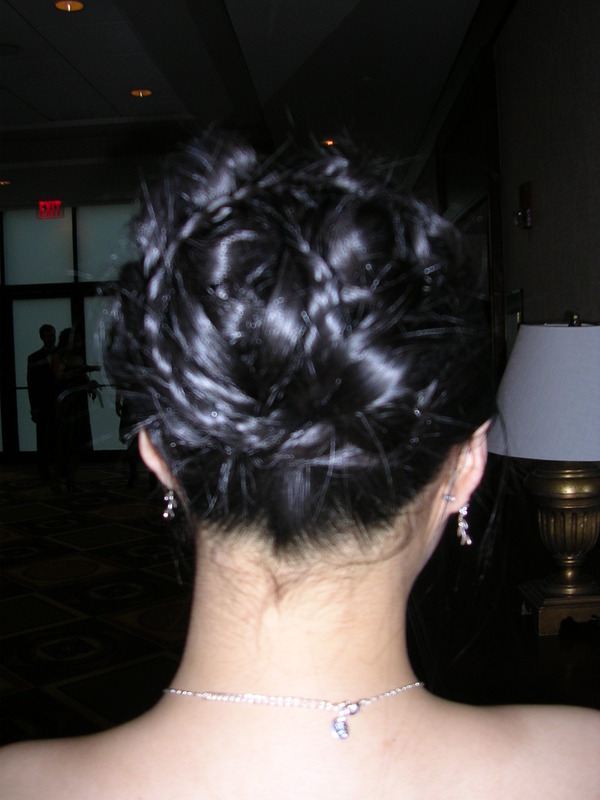 It was a non-symmetrical updo, with a mixture of curls, pinned up sections, and even a mini-braid added for variety, and the stylist left my shorter hair in front as a soft side-swept piece to frame my face. Painting my fingernails and toenails (two different shades of pink), then eating part of a salad topped with grilled sha cha (Chinese satay) seasoned chicken while waiting for the polish to dry. I didn't want to go to senior ball starving, but I also wanted to save room for the dinner which was in about 3 hours, so I ate about 3 oz. 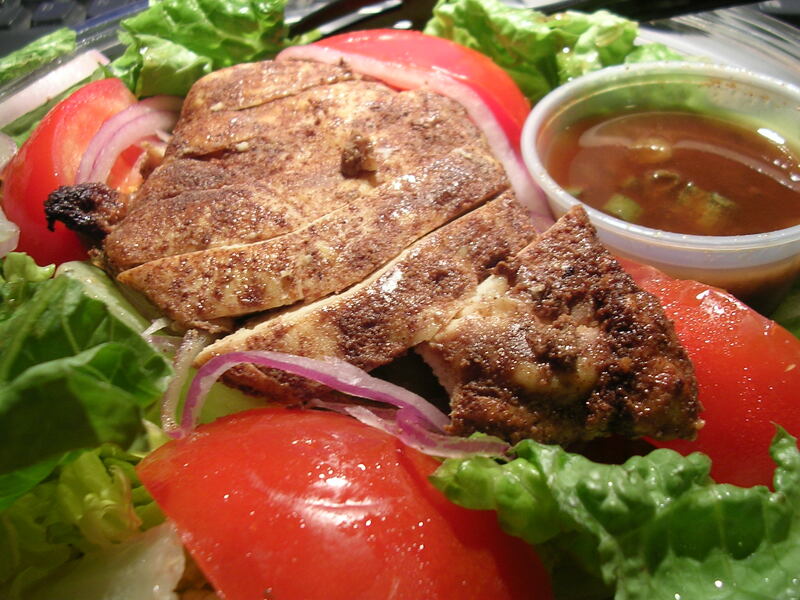 of the chicken and 1/3 of the salad greens dipped in a vinaigrette dressing made with sha cha seasoning, sesame oil, vinegar, and scallions. According to Wikipedia, sha cha sauce/paste is made with soybean oil, garlic, shallots, chilis, brill fish, and dried shrimp. Interesting, I couldn't tell from the flavor. I met my boyfriend at about 6pm and he gave me my corsage. It was so pretty! 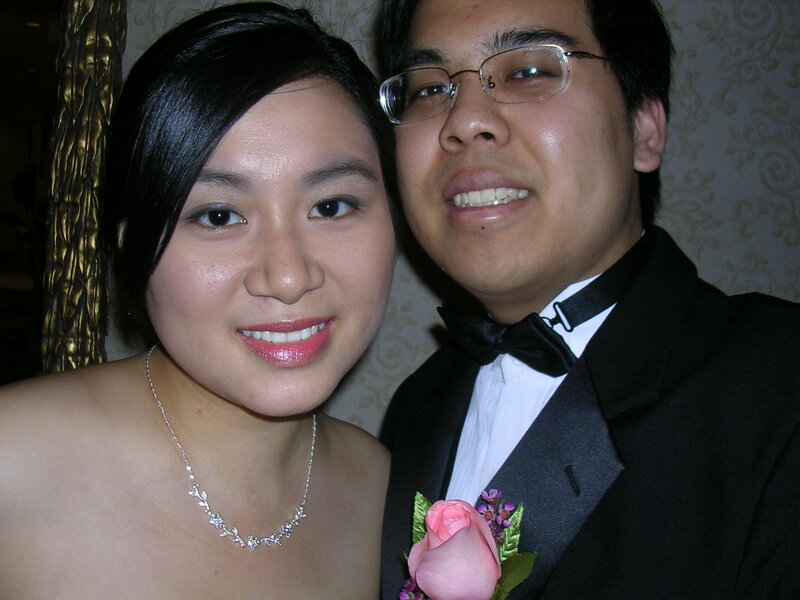 We went to the florist to order the corsage and the boutonniere together so that they'd match. 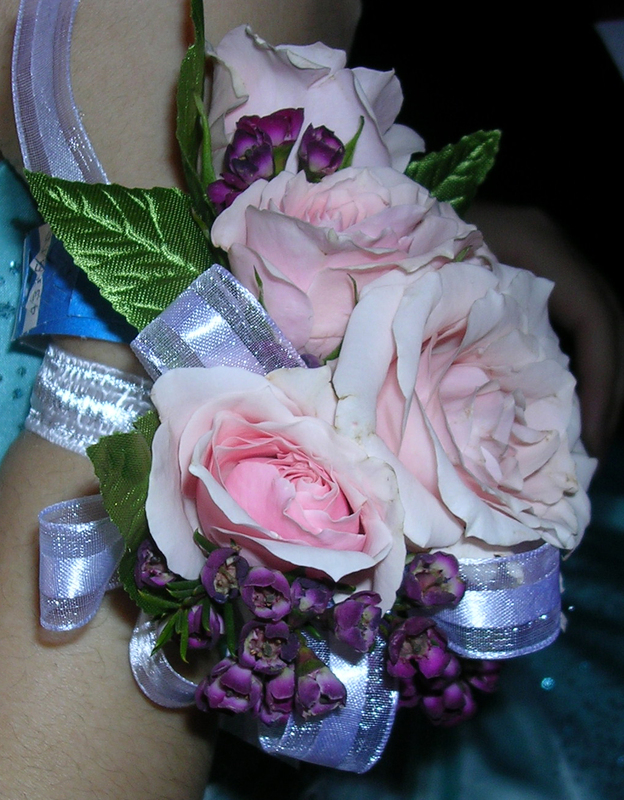 I got light pink roses of different sizes for my corsage, decorated with purple accent flowers and a white satin ribbon. 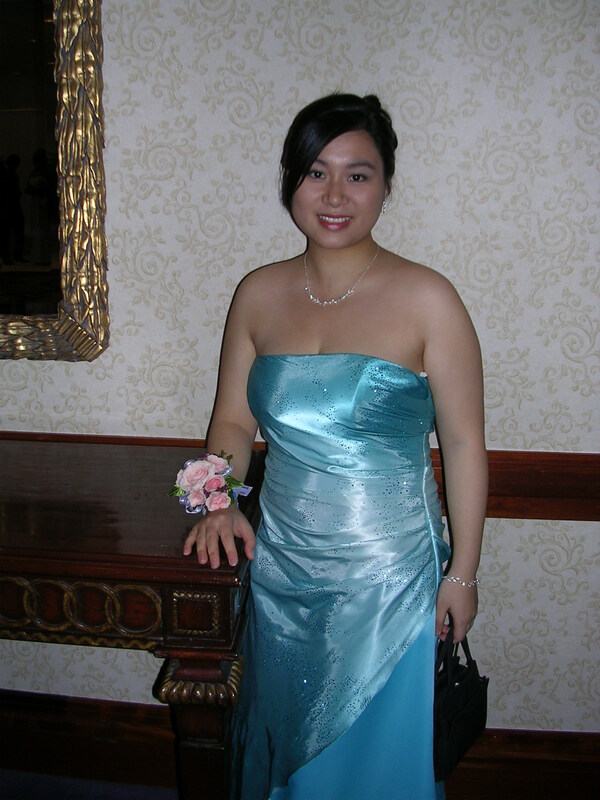 I didn't know which dress I was wearing when I chose the corsage, so I tried to get one that would match most colors lol. 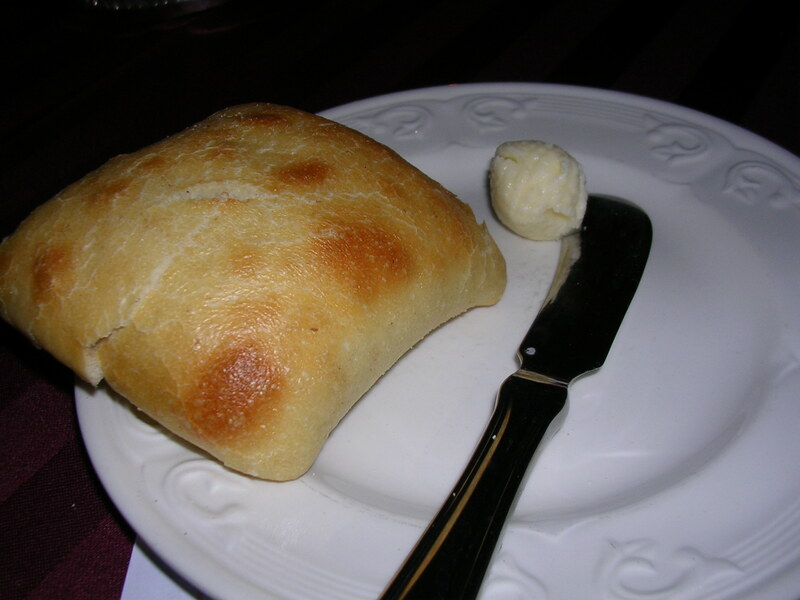 Dinner started off at the Sheraton with a basket of rolls and a plate of little balls of butter. The bread was okay, but I was slightly weirded out by the butter balls. I prefer other butter designs much more. The little balls just seemed odd. 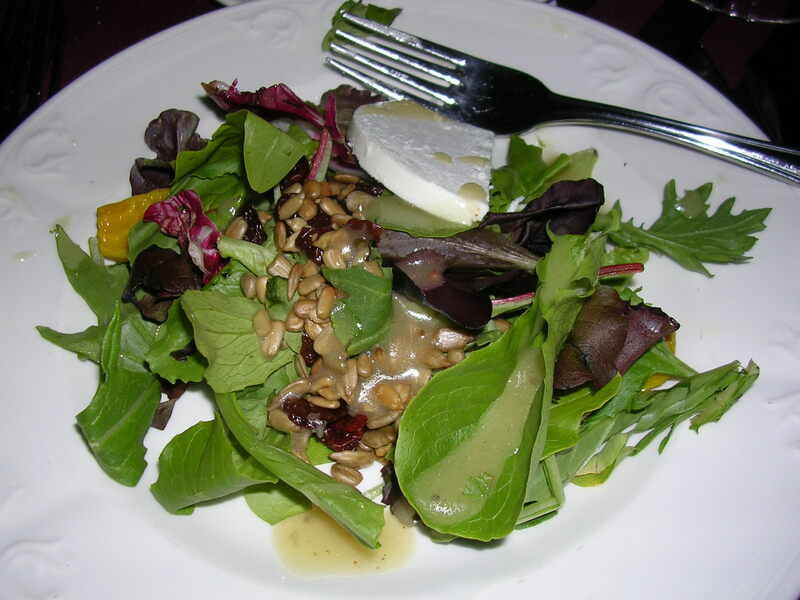 Next came a salad of baby greens, baby yellow beets, sunflower seeds, dried cherries, and a slice of goat cheese, all drizzled with champagne vinaigrette dressing. The salad was actually pretty good, I really liked the combination of sunflower seeds with the sweetness of dried cherries. The goat cheese was soft and mild, which gave the salad some creaminess to balance the vinaigrette. Even the baby beets were good, they were subtle, and reminded me of squash. For our entree we had a choice of pork chops, baked chicken, or vegetarian napoleon. I went with the pork chops, and while it was okay, I had expected much better. The pork chop itself came as a thick chop maybe an inch or more thick. 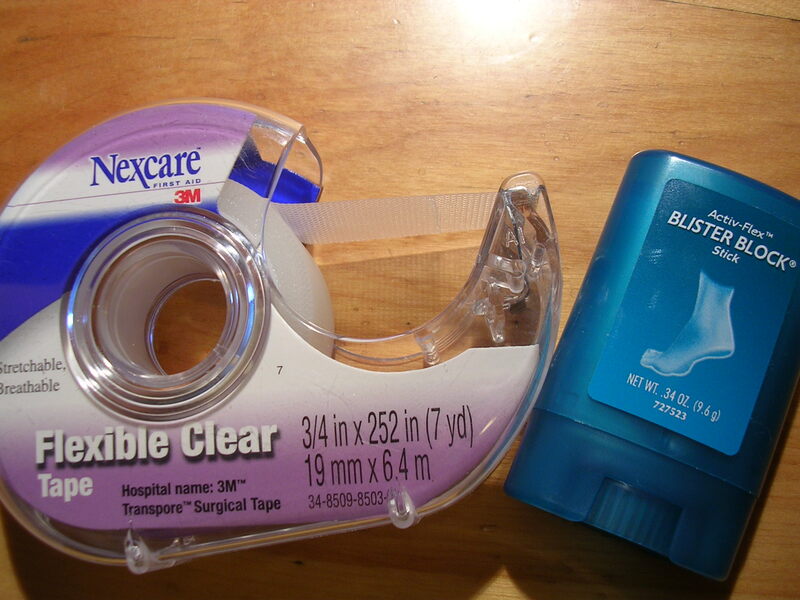 In effect, the middle was dry and difficult to cut and chew. The pork chop was topped with a little bit of bbq sauce, and some tiny fried sweet potato strings that looked more like shaved sweet potato bits than anything else. 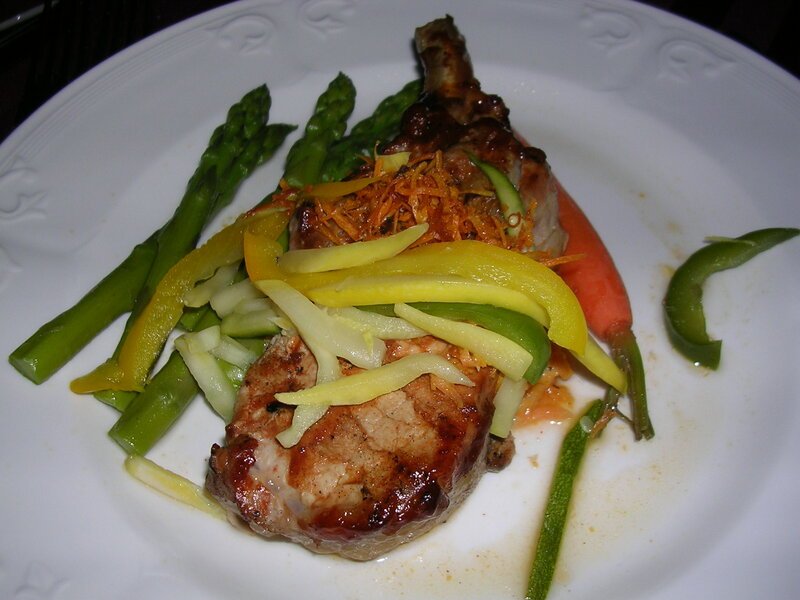 The pork had mixed vegetables on the side, including asparagus, peppers, squash, and a small carrot. You can't see it in the picture but there's a dallop of mashed sweet potatoes under the pork chop, which was creamy but infused with ginger (I dislike ginger). The dinner was served with peach and ginger chutney and beurre blanc sauce. I poured a little bit of each on my plate to see if it would go with the pork, but all I really wanted was more of the bbq sauce on the pork. After dinner we got a dessert that was unfortunately very disappointing. It was supposed to be tiramisu with strawberries and raspberries drizzled with chocolate. We got a tiramisu that I wouldn't even consider a real tiramisu. It had no espresso soaked layer on the bottom! 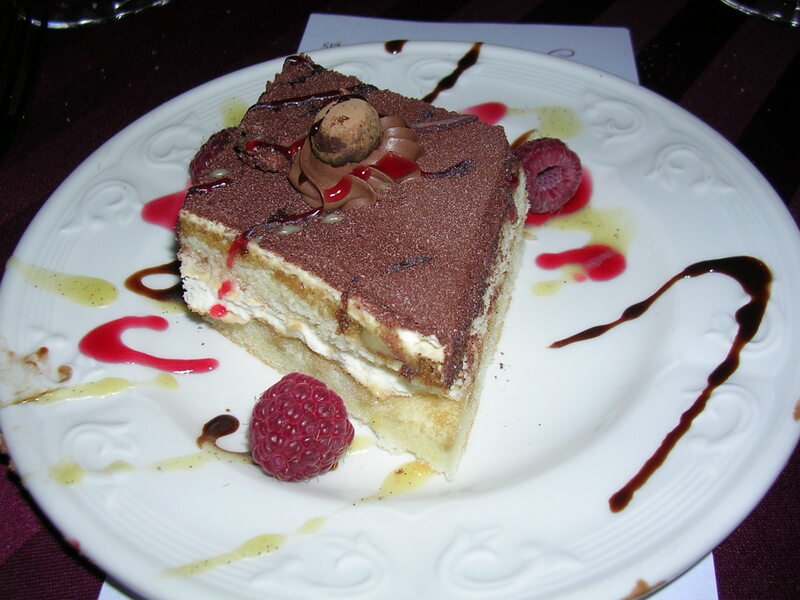 It was just a layer of marscapone sandwiched between two layers of sponge cake, then dusted with cocoa on top. Therefore, it was terribly dry for a tiramisu (though perhaps okay if I consider it just a regular sponge cake with cream), and we didn't even get the strawberries with it. For a dessert-lover like me, this was such a tragedy. Dinner was served with ice water only, and if you wanted other drinks you had to buy it from a cash bar. 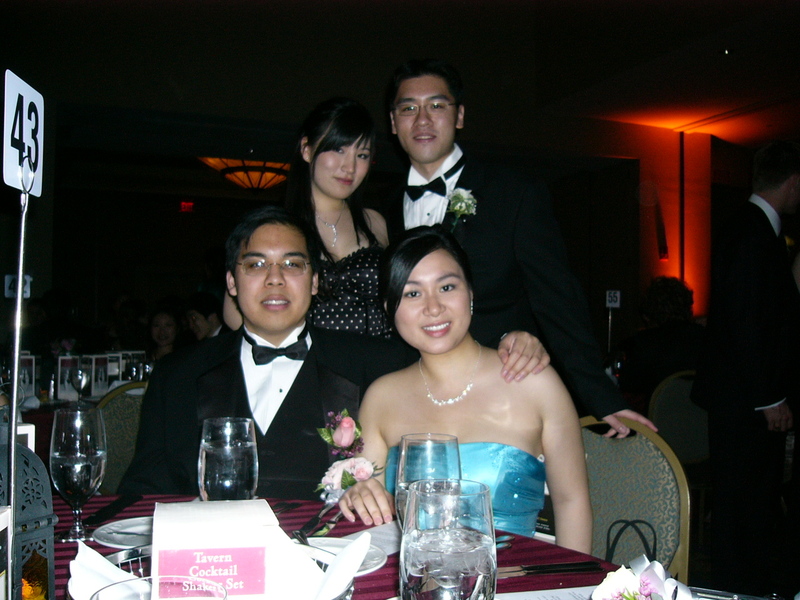 The menu clearly stated that we were supposed to get complimentary iced tea with dinner, but that never appeared at any point during the ball. Bummer. 2 drinks of peach Schnapps mixed with Mountain Dew, 1.5 powdered sugar covered crunchy round things that looked like donut holes, and a small handful of pretzels. 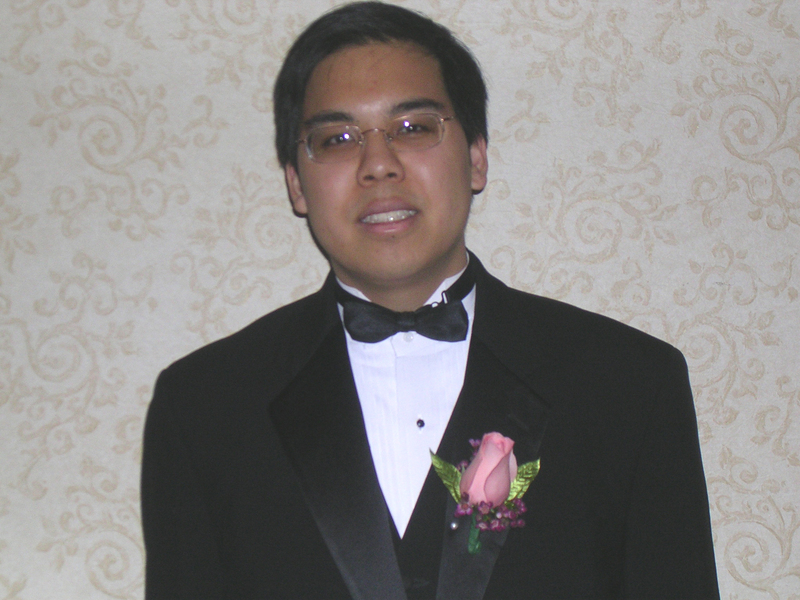 This entry was posted on Tuesday, May 8th, 2007 at 10:14 pm	and posted in American, beverages, cheese, Chinese, desserts, friends, Italian, me, pork, poultry, restaurant, snacks, Uncategorized. You can follow any responses to this entry through the RSS 2.0 feed.